Kip Hedges, the Delta baggage handler who was fired for speaking out about low pay, wants his job back. Hedges told CNNMoney that he filed an appeal with Delta's human resources department Thursday asking to be reinstated. He plans to wait a couple of weeks for a response, and he's prepared to file a wrongful termination lawsuit if the airline refuses to give back his job. For 26 years, Hedges has loaded and unloaded Delta planes at the Minneapolis-St. Paul airport. But last week, he was fired for comments he made in an online video about the airline's low wages for its employees. In the video, Hedges said many Delta workers make less than $15 an hour and that "a lot of the better paid workers also understand that the bottom has to be raised otherwise the top is going to fall as well." Hedges said that Delta managers on Dec. 2 told him he was being fired for making "disparaging" comments about the company. "Delta requires all employees to meet company performance and conduct standards," the airline said in a statement. "This includes upholding our core values of respect and honesty in any communications regarding Delta." Hedges said he can't think of any reason why Delta would fire him for his performance or conduct. "You would be hard-pressed to find a single one of my coworkers on the ramp or a supervisor that wouldn't want to work with me," he said. "I really pride myself on my work ethic and my conduct." 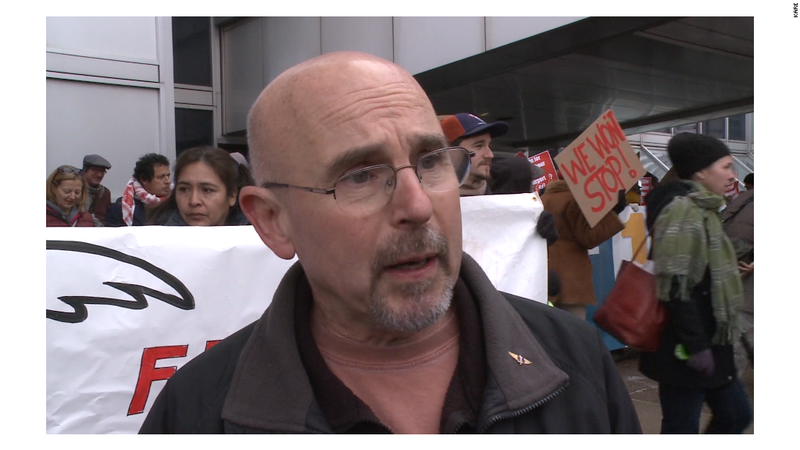 Instead, Hedges believes his role in helping to unionize airport workers is the real reason Delta wanted him out. "Maybe they think that firing a prominent advocate for the union would chill the movement to organize," he said. Baggage handlers had been unionized prior to the merger of American Airlines and US Airways in 2013, when the campaign to form a union failed by 300 votes. Now, with the labor movement gaining steam in Minnesota and many other states, Hedges said Delta is becoming more anti-union. He pointed out that Delta was part of a lawsuit filed by several U.S. airlines in November to block pay increases for airport workers at Seattle's Sea-Tac airport. The company said it "invites healthy, constructive discussion across all areas of its business." Hedges said he's been overwhelmed by the outpouring of support from fellow baggage handlers, union leaders and local politicians including Rep. Keith Ellison. A petition filed on Coworker.org demanding that Hedges be rehired has received more than 1,500 signatures. In the meantime, Hedges said he plans to stay involved in the fight to unionize airport workers in Minnesota. "I'm not going to walk away from this now," he said. "It's too important for a lot of people."